Thai architects Architectkidd and product designers Osisu have collaborated on a project where spare bits of cladding have been made into furniture. Called Furniture from Buildings, the building features a perforated white aluminum-composite facade, with the circular off-cuts used as seats for stools. The furniture also makes use of scrap wood from Bangkok construction sites. Architectkidd have been searching for simple approaches to recirculate waste materials from building construction into other uses. For the facade of a recent building for the lighting company Lightmos in Bangkok, Thailand, the design objective was to create a new exterior layer to prevent the direct transmission of heat and outside light, while maintaining permeable qualities. After experimenting with different materials and techniques, the selected facade material was white aluminum composite, an inexpensive but workable material. 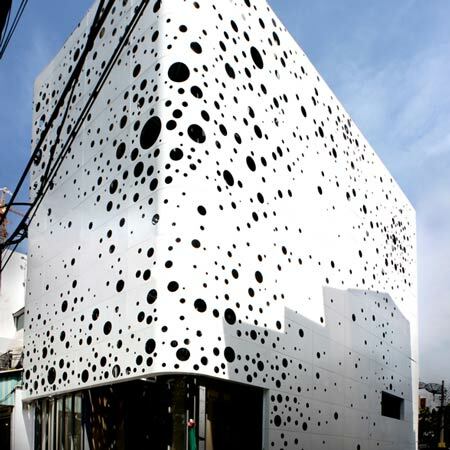 Circular holes was used as a kind of an optimization technique because it was an efficient way to create a closed shape, and it minimized the machine cutting time for the facade panels. To redirect the material offcuts from the building site, a cross-disclipinary approach was needed. Architectkidd collaborated with product designers Osisu to create a series that could integrate the aluminum “holes” into furniture design. Along with the aluminum offcuts, scrap wood collected from other construction sites in Bangkok was utilized to form the support base of the seating. The result is not only a building, but a new series of furniture available in a range of functions and scales - coffee tables, lounge seating and individual benches.